Climbers Holden Brock, Sam Briley, and Spencer Chinery, from right, climb over boulders to their next route on Denny West at the newly dedicated Denny Cove addition to South Cumberland State Park on Friday, March 17, 2017, near Sequatchie, Tenn. The 685-acre addition is home to more than 150 rock climbing routes. 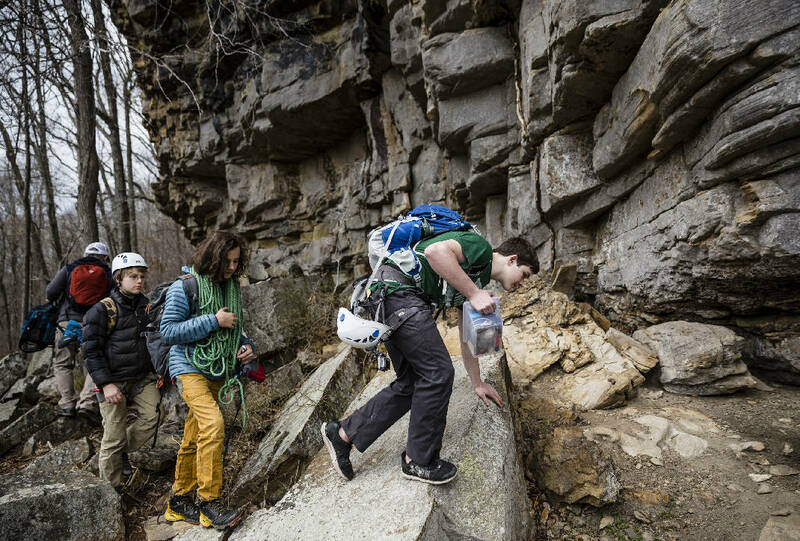 DENNY COVE, Tenn. — A team of conservationists bent on turning Denny Cove into a publicly accessible rock climbing destination encountered plenty of obstacles on the route. But they stayed in the harness, eyes fixed on a day like Friday. Dozens of nonprofit leaders, climbing advocates, state park officials and community leaders gathered deep in the woods of Marion County on Friday afternoon to commemorate the state's acquisition of the pristine 685-acre tract. "It's like getting to the end of a really long, arduous climb," said Zachary Lesch-Huie, Southeast regional director for Access Fund, a climbing advocacy organization. Denny Cove is expected to further elevate Southeast Tennessee's status as a premier climbing locale, joining with nearby Foster Falls and Castle Rock to create a stretch of climbing along Highway 51 that some say is world-renowned. "What a day for Marion County," County Mayor David Jackson said over the sound of a nearby waterfall. "You cannot beat this." Acquiring Denny Cove first came into climbers' sights in 2011, when a group of them began generating momentum for the project. The land was owned by a timber company. Now it is the latest addition to the sprawling South Cumberland State Park. State park and volunteer crews will continue work over the next several months, with plans to add backcountry camping, restrooms and additional trails to the cove. For now, it's open to climbers until dark on Saturdays and Sundays. A group of children took to the cliff Friday during the dedication ceremony, which overflowed the limited bench seating available in a clearing in the woods. "Those young folks down there, some day, will be adults with kids and grandkids," said Ralph Knoll, the Tennessee representative for The Conservation Fund. "Everyone up here had a hand in protecting this property. The folks down there may not understand that today, but they'll have kids and grandkids coming out here 40 or 50 years from now and this property will still be here and available. We should all give ourselves a pat on the back for making that happen." Lesch-Huie explained that Denny Cove narrowly missed out on earlier acquisition efforts. Climbing organizations got involved in 2012 and were asked if it was a project they would be interested in contributing to. "If you're not a climber, I just want to say as plainly as possible how good this climbing area is," Lesch-Huie said. "It really is a nationally significant climbing area that's going to attract folks from around the region, around the country and around the world." Denny Cove cost $1.23 million to acquire from the timber company in July 2016. With assistance from the project's partners, the Access Fund and Southeastern Climbers Coalition took ownership and spent several months blazing trails and getting the land ready to be added to South Cumberland State Park. The state paid $627,000 for it in December, according to online property records. "It has been a massive visioning transaction puzzle for quite a long time," said Land Trust for Tennessee president Liz McLaurin, "and it has created such a beautiful place."